At the start of the 1st World War the Port of London Authority( PLA) employed thousands of men to manage the docks and River Thames activity upstream from the Port of London. By the end of August 1914 over 800 men from the PLA had signed up and by the end of the war this number had risen to nearly 4,000. Sadly over 400 were killed and over 700 injured during the war. Amongst the many medals won by PLA employees were two VC's. 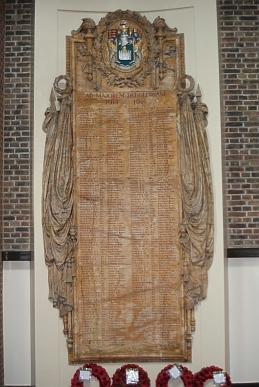 At the end of the war two marble tablets were commissioned to bear the names of all the men who fell in the war. 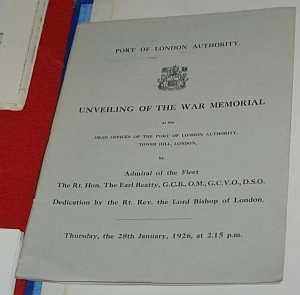 These were placed in the head office of the PLA in London. With the port business being located from the Pool of London to Tilbury these tablets were moved to their current home at the London Cruise Terminal at Tilbury. 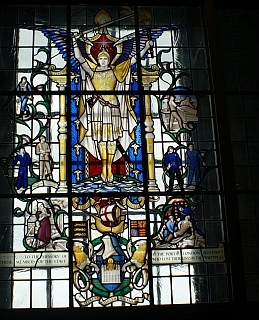 A stained glass window was added to commemorate the members of the PLA who died in WW2.